1008 Pearls of Sayings of Bhagavan Sri Sathya Sai Baba An ardent devotee, who wishes to remain anonymous, has woven this resplendent garland of 1008 petals, each one suffused with the honey-dew of the Grace of the Divine Master. Baba – From the Uri Geller’s website. Baba: The Life Breath of Every Soul By Chandur D. Mirchandani. Bhagavan Baba on Namasmarana Compilation of quotations on Namasmarana by Bhagavan Sri Sathya Sai Baba. Buddha’s Gospel of The Good Life In Bhagavan Sri Sathya Sai Baba’s own words. Compiled by Rameesh & Ananda Kasturi. Chinna Katha (.pdf) Childrens stories as told by Bhagwan Sri Sathya Sai Baba. Guide to Indian Culture and Spirituality Based on the Divine Teachings of Bhagawan Sri Sathya Sai Baba. By Smt. Kausalyarani Raghavan, 7th Edition, 1997 – © Sri Sathya Sai Books & Publications Trust Prasanthi Nilayam. He has come – By Patrick Gallivan A biographical account of the life of Sri Sathya Sai Baba, the Avatar and spiritual teacher of this present age. Manuscript blessed by Bhagavan Sri Sathya Sai Baba. I am By Al Drucker. Journey to India A Spiritual Awakening with Bodhidharma, Durga, and Bhagawan Sri Sathya Sai Baba. 108 Teachings on Divine Love from Sri Sathya Sai Baba. Man of Miracles By Howard Murphet. Namasmarana – A Universal Sadhana A Garland of Extracts from Sri Sathya Sai Baba’s Discourses. Namasramara – The Supreme Sadhana Written and Published by Mohan A Bharwani. Questions & Answers These quotations are taken from the Sai Dictionary of Quotations, a collaborative work of 36 Sainet devotees. Quiz on Bhaagavatham Based on the Divine Discourses of Bhagavaan Sri Sathya Sai Baba. Published in India by: The Convenor, Sri Sathya Sai Books and Publications Trust, Prashaanthi Nilayam, India. Ramanavami – An exposition by Bhagavan Sri Sathya Sai Baba From the book – Festivals at Prasanthi Nilayam and Their Significance – An Exposition by Bhagavan Sri Sathya Sai Baba – Compiled and Edited by Suresh C Bhatnagar. Revolutions in Consciousness From Copernicus to Newton to Darwin to Einstein to Sai. A Festschrift, Commemorating the 75th Birth Anniversary of Professor V. K. Gokak, Vice-Chancellor, Sri Sathya Sai Institute of Higher Learning (Deemed University) by Alvin Drucker, Visiting Lecturer, Prashanti Nilayam, August 25, 1986. Sai Avathar A Humble offering at the divine lotus feet of Bhagawan. The Book blessed by Bhagawan. By Aravind Subramaniam. Sai Baba – His Mission, An Introduction By The Sathya Sai Baba Central Council Of United States Of America. Sai Baba Gita The Way to Self-Realization and Liberation in this Age. Compiled and edited by Al Drucker. Published by Atma Press. Sai Baba Gita Online edition of the book “Sai Baba Gita”, which is a compilation of Swami’s Discourses on Gita in the year 1984 by Al Drucker. Sai Baba. The Saint of Shirdi – By Mani Sahukar. Saithree – Manthra, Yanthra, Tanthra (PDF) By Sri Ghandikota V. Subba Rao. Sarvadevi Swarupini – Vedamatha Gayatri This book are released on the auspicious occasion of the installation of VEDA MAATA GAYATRI idol by our Beloved Bhagawan on 9th October, 1998 at Prasanthi Nilayam. Compiled, edited and Presented by J.V.Krishnamurthy (JVK). Published by Sri Sai Padhuga Trust, Madurai (India). Sathyam Sivam Sundaram The Life of Bhagavan Sri Sathya Sai Baba written by N. Kasturi, M.A., B.L. Shirdi Sai and Sathya Sai are One and the Same By Arjan D Bharwani. Complete Shri Sai Satcharita – The Life History of Shri Sai Baba of Shirdi By Shri Hemadpant. Spiritual Practices (Training Aid) By Vladimir Antonov. Sri Sathya Sai Vratha Kalpam (Procedure of Worship of Sri Sathya Sai) By Pedda Bottu. The Life and Message of The Buddha From extracts of speeches/writings of Bhagawan Sri Sathya Sai Baba. Published by Sathya Sai Central Central Council of Malaysia. The Lights of Home By Howard Murphet. The Transcendental Truth A Buddhist Perspective of Bhagavan Sri Sathya Sai Baba. By Nandini Samarasinghe. Excerpt from book by Bhagavan Sri Sathya Sai Baba “Prashaanthi Vaahini”. What Is Real And What Is Unreal? Talk presented by Yaani Drucker at the United Kingdom Sai Baba retreat, April, 2000, followed by excerpts from Al Drucker’s talk on the same subject. Receuil de citations sur l’Amour de Sathya Sai Baba. 2500 mots tirés des discours et livres de Sathya Sai Baba. Citations de Baba compilées sur 89 thčmes. Amour, Famille, Paix, Vérité, Action juste, etc. Puisés dans les différentes croyances et foi. Un écrit trčs inspirant en cette fin de l’âge noir. Livre d’information sur le voyage en Inde, en particulier ŕ l’ashram Demeure de Paix Supręme. De Sri Ghandikota V. Subba Rao. Une traduction francaise complčte du livret “Saithree – Mantra, Yantra, Tantra”; du site Sai Darshan. La vie, l’oeuvre et la mission de Sathya Sai Baba. La descente du divin sur terre. Amrita Vahini – Sathya Sai’s Nektar der Unsterblichkeit (PDF) Dies ist eine Sammlung von Gesprächen welche die Autorin im Verlauf von 20 Jahren auf der inneren Ebene, während ihrer allmorgendlichen Meditationen, mit Sai Baba geführt hat. Das Kapitel über die “Dunkle Phase” erklärt, weshalb Devotes manchmal eine Durststrecke auf ihrem spirituellen Weg durchleben und das Gefühl haben, von Gott getrennt zu sein. Des Menschen Weg (PDF) Ausgesuchte Zitate zum Thema aus den Lehren des Avatars Sathya Sai Baba und des tibetanischen Meisters Djwhal Khul, zusammengestellt von Annrose Künzi. Meditation ist Leben (PDF) Das Thema Meditation beschäftigt seit Jahrzehnten immer mehr Menschen. Dieses Buch enthält Informationen über Hintergründe, Methodik und Ziel der Meditation, fussend auf den grossen philosophischen Lehren des Welt-Avatars Sathya Sai Baba und von Alice A. Bailey/Tibeter, zusammengestellt von Annrose Künzi. Sai Baba e la straordinarietŕ quotidiana Raccolta di esperienze dei devoti – aperto a contributi. Online shopping of Books, Music, Handicrafts and Photos. Sathya Sai Books and Publications Trust at Prashanthi Nilayam. Online bookstore run by the Trust. The Sathya Sai Book Center of America, a not-for-profit foundation dedicated to making available the teachings and discourses of Bhagavan Sri Sathya Sai Baba, as well as reputable material by other authors. 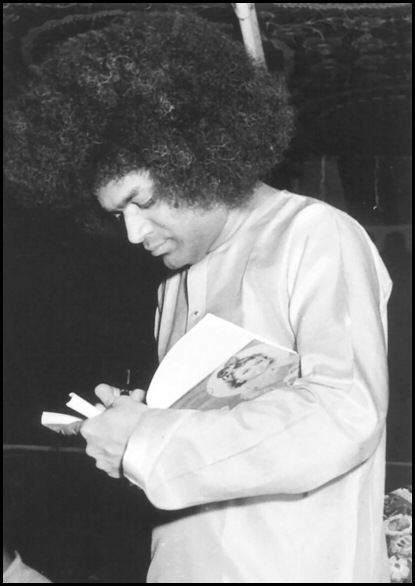 The Book Center was founded in 1969 as a means to disseminate the teachings of Bhagavan Sathya Sai Baba in America. Toronto, Canada – The Official Bookcentre of the Sai Organization in Canada. London, England – Website for Sri Sathya Sai Books – UK. Catalogs of Books, Music and Videos carried by the store, price list, ordering information, contact information etc. An account of some of the achievements of Sathya Sai Baba, one of the most impressive men of miracles to appear for centuries. Vol. 1, 4th ed. ; v. 3, 2d ed. ; v. 8-9, 1st ed. Spine title: Sathya Sai Baba; cover title: Sai Baba. This book offers fascinating glimpses into the lives and miracles of Shirdi Sai Baba and other Perfect Masters. Life of Sathya Sai Baba, b. 1926, Indian religious leader. – Satya Sai Baba: The Godman of India Today. On Sathya Sai Baba, b. 1926, Hindu religious leader. On Sathya Sai Baba, b. 1926, Hindu saint from Andhra Pradesh. Intrepretation of the philosophical ideas of Sathya Sai Baba, Hindu religious leader. – Life is a Game, Play It! Contributions of Sathya Sai Baba, b. 1926, Hindu mystic, to education; contributedarticles. Taken from : Sathya Sai speaks, Prasanthi vahini, Summer showers in Brindavan, andSathyam Sivan Sundaram. Foreword dated 18 August 1976. Sathya Sai … Baba Cover title: Education in human values. Subtitle on cover: Discourses on basic spiritual values. In a series of thirty-four beautifully luminous drawings, Allexi Allens has visualycaptured the spirit of Sai Bab’s unique message and purpose. Adamowski shares the intimate details of her relationship with a spiritual master andreveals the little-known way in which she received liberation from future incarnations during a personal interview with Sathya Sai Baba. Compiled from N. Kasturi, Sathya Sai speaks, v.1. – Bhagavan Sri Sathya Sai Baba: Sai Sanathana Sadguru. – One Single Stream of Love: Quotes from Sri Sathya Sai Baba. … Sathya … Baba Glossary p.208-216.